Cambodia, also known as Kampuchea or officially the Kingdom of Cambodia, is a country in Southeast Asia located south of the Indochina peninsula. It is 181,035 sq.m in an area and borders Thailand in the northwest, Laos in the northeast, Vietnam at the east and the Gulf of Thailand in the southwest. It has a population of approximately 16 million. There are 4 main areas to consider when moving to Cambodia - each offering its own charm and catering to different sets of people. Phnom Penh, previously known as Krong Chaktomuk, is located on the banks of Tonlé Sap, Mekong and Bassac river and is home to about 11% of the country’s population. It has been the capital city since the French Colonization and developed into the center of the country’s cultural, economic and industrial sector. The city of Phnom Penh is dubbed as the “Pearl of Asia” because it was one of the most beautiful cities built by French Architects back in the 1920s and is still widely known in Southeast Asia for its historical attractions and architecture. Even at present, large villas and French colonial buildings are still scattered around the city. Aside from the tourist attractions, Phnom Penh attracts a lot of attention because this area is where you can find everything - from job opportunities to residential and commercial spaces, international schools, banks, pharmacies, hospitals, markets, coffee shops, bars and restaurants. There is very little that you need and will not find in the city. Siem Reap is the 10th largest province in terms of land area and populated by approximately 7% of the country’s entire populace. It is part of the 9 provinces that make up the Tonle Sap Biosphere Reserve because a large part of the province’s southern border is occupied by the Tonle Sap River. The province is also the site of Angkor and the Angkor Wat temple ruins, which is now declared as one of UNESCO’s World Heritage sites and thus, protected by its’ mandate. 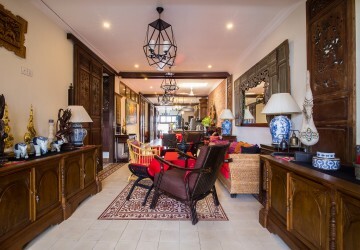 Siem Reap is a popular tourist destination and has a large number of , resorts, guesthouses, restaurants, and commercial establishments catering to the tourism sector, primarily due to its proximity to the Angkor Wat temples. In recent years, there has also been a boom in residential and commercial spaces, attributed mainly to foreign investments and expats wanting to stay long term in the province. Sihanoukville is a province located in the Southwest of Cambodia besides the Gulf of Thailand. About ⅓ of the province is surrounded by beaches, making it a popular place for tourists visiting the country. Sihanoukville - the town, is the province’s economic center and is also the location of the Sihanoukville Special Economic Zone (SSEZ), an overseas economic and trade cooperation zone that promotes favorable market conditions. Currently, the whole province is undergoing major economic development due to the influx of foreign investment. Tourism is still a major player in the province’s economy. Large tracts of land are being snatched as fast as they are put in the market and being built into high-rise buildings, hotels and apartments to meet the growing demand. Whether it’s in the urban areas or in one of the rural towns, the opportunity to invest in this area is very high. Other than the 3 major developed areas in Cambodia, there are many other provinces in the country that boasts of their own unique charms. 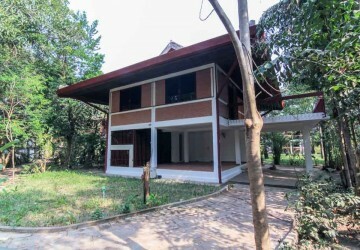 Our listings will include properties in Kampot, Kandal, Battambang, Kep, Katie, and Takeo. Kampot Province is world-renowned due to the Kampot Peppers, organically grown, produced and sold in green, black, white and red varieties. The climate in the province offers perfect conditions for growing pepper and the quartz content of the soil in the foothills of the Elephant Mountains helps to give Kampot pepper its unique character. Kandal is located in the southeast and surrounds the city of Phnom Penh. It also borders the provinces of Kampong Speu, Takeo, Kampong Chhnang, Kampong Cham, Prey Veng and shares an international border with Vietnam in the south portion of the province. It is ideal for homeowners or investors that want to live near their place of work but still feel the beauty and charm of living in the countryside. 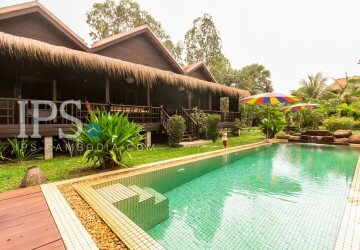 Battambang is included in the Tonle Sap Biosphere Reserve list. Located in the far northwest and borders the provinces of Banteay Meanchey, Pursat, Siem Reap and Pailin, the north and south end of the province's west side is bordering Thailand. 75% of the province is composed of jungles and mountains and mostly rely on the agricultural economy. Battambang is dubbed as "The Rice Bowl of Cambodia". Kep is the smallest province and is home to the Kep National Park. It is surrounded by Kampot Province except for south side in front of the Gulf of Thailand. The province is also where the Kep Peninsula can be found. This is a tiny archipelago comprising of 13 islands (Koh), the most famous of which is Koh Tonsay or more popularly known as Rabbit Island. Kratie Province is known for its beautiful riverside scenery, green villages and paddies, and the famous Irrawaddy river dolphins. The province is comprised of many forests, the Phnom Pram Poan mountain range, Phnom Prech and rubber plantations. The Eastern portion of the province is an important bird area. Takéo is a province located in the southwest and borders the provinces of Kampot, Kampong Speu and Kandal. The south boundary borders Vietnam. It is often referred to as the "cradle of Khmer civilization" because the former kingdom of Funan is centered in this region.